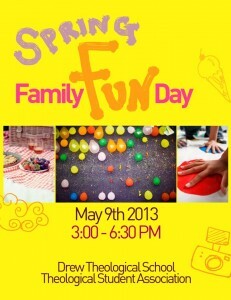 You are invited to the Spring Family Fun Day! Thursday, May 9, 2013 from 3:00 pm to 6:30 pm. Take a break from papers and come chill with other students and their families! Food, games, fun. Balloon animals and face-painting too! Activities will be held in the Atrium and on the Seminary Hall Lawn.